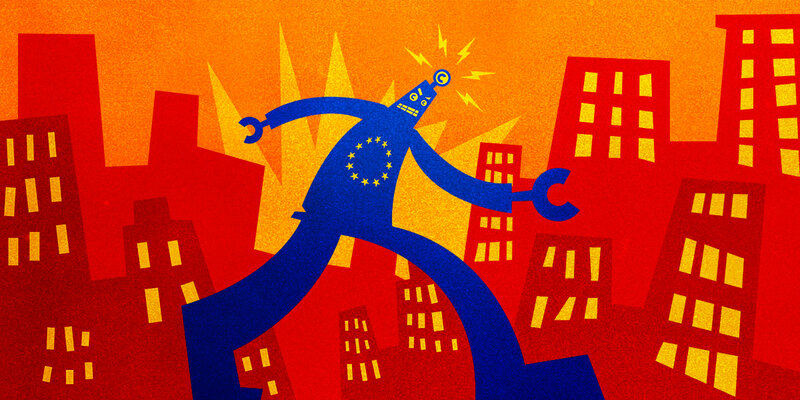 In a stunning rejection of the will of five million online petitioners, and over 100,000 protestors this weekend, the European Parliament has abandoned common-sense and the advice of academics, technologists, and UN human rights experts, and approved the Copyright in the Digital Single Market Directive in its entirety. There’s now little that can stop these provisions from becoming the law of the land across Europe. It’s theoretically possible that the final text will fail to gain a majority of member states’ approval when the European Council meets later this month, but this would require at least one key country to change its mind. Toward that end, German and Polish activists are already re-doubling their efforts to shift their government’s key votes. If that attempt fails, the results will be drawn-out, and chaotic. Unlike EU Regulations like the GDPR, which become law on passage by the central EU institutions, EU Directives have to be transposed: written into each member country’s national law. Countries have until 2021 to transpose the Copyright Directive, but EU rarely keeps its members to that deadline, so it could take even longer. Unfortunately, it is likely that the first implementation of the Directive will come from the countries who have most enthusiastically supported its passage. France’s current batch of national politicians have consistently advocated for the worst parts of the Directive, and the Macron administration may seek to grab an early win for the country’s media establishment. Countries whose polity were more divided will no doubt take longer. In Poland, politicians were besieged by angry voters wanting them to vote down the Directive, while simultaneously facing brazen denunciations from national and local newspaper owners warning that they would “not forget” any politician who voted against Article 11. The passing of the Directive will still leave that division between the Polish people and the media establishment, with politicians struggling to find a domestic solution that won’t damage their prospects with either group. The rhetoric in Germany in the last few days was not much better. German politicians claimed with straight faces that the tech companies had paid this weekend’s protestors to march on the streets. Meanwhile, the Christian Democratic Union, Angela Merkel’s party, whose own Axel Voss as the ringleader for the Directive, put out a policy proposal that suggested it could implement Article 13 not with filters, but with a blanket licensing regime. Legal experts have already said that these licenses won’t comply with Article 13’s stringent requirements – but it’s going to be hard for the CDU to walk back from that commitment now. Which brings us to the future prospect of legal challenges in Europe’s courts. Again, unlike the GDPR, which gave existing regulatory bodies the clear power to adjudicate and enforce that law and its ambiguities, it’s unclear who is supposed to impose consistency in the EU between, say, a harsh French regime and a potentially softer German solution, or interpret the Directive’s notoriously incoherent text. That means it will fall by default to Europe’s judicial system, and the long, slow road to a final decision by the EU’s superior court, the European Court of Justice (ECJ). We can expect media and rightsholders to lobby for the most draconian possible national laws, then promptly march to the courts to extract fines whenever anyone online wanders over its fuzzy lines. The Directive is written so that any owner of copyrighted material can demand satisfaction from an Internet service, and we’ve already seen that the rightsholders are by no means united on what Big Tech should be doing. Whatever Internet companies and organizations do to comply with twenty-seven or more national laws – from dropping links to European news sites entirely, to upping their already over-sensitive filtering systems, or seeking to strike deals with key media conglomerates – will be challenged by one rightsholder faction or another. But there’s also opportunities for the courts to rein in the Directive – or even throw out its worst articles entirely. One key paradox at the heart of the Directive will have to be resolved very soon. Article 13 is meant to be compatible with the older E-Commerce Directive, which explicitly forbids any requirement to proactively monitor for IP enforcement (a provision that was upheld and strengthened by the ECJ in 2011). Any law mandating filters could be challenged to settle this inconsistency. But who will represent Internet users in court? Big Tech has some of the motive and the millions to do it, but after this heavy defeat, those increasingly defensive giants may well decide that it will be better to settle out of court, and strike a deal that pays a danegeld to the established media in Europe – at a price that will conveniently lock out any potential tech upstarts to their market dominance in that market. That means Europe’s Internet users can’t depend on the tech companies to fight this. The battle will have to continue, as it has done in these last few weeks, with millions of everyday users uniting online and on the streets to demand their right to be free of censorship, and free to communicate without algorithmic censors or arbitrary licensing requirements. EU netizens will need to organize and support independent European digital rights groups willing to challenge the Directive in court. And outside Europe, friends of the Internet will have to brace themselves to push back against copyright maximalists attempting to export this terrible Directive to the rest of the world. We must, and we will, regroup and stand together to stop this Directive in Europe, and prevent it spreading further.